Candidates born between 07th July 1997 and 20th December 2000 (both days inclusive) are eligible to appear in the Recruitment Rally. Candidate should have passed Intermediate / 10+2 / Equivalent Examination in any stream/subjects approved by Central / State Education Boards with minimum 50% marks in aggregate and 50% marks in English. Candidate should have passed Intermediate / 10+2 / Equivalent Examination in any stream/subjects approved by Central/ State Education Boards with minimum 50% marks in aggregate and 50% marks in English. Eligible candidates can attend Airmen Recruitment Rally at Guruvarya Dadoji Kondadev Sainiki Shala Tasgaon, Distt – Sangli, Maharashtra from 08.05.2017 to 12.05.2017. Candidates required to register themselves from 5.30AM to 9.30AM on same date of rally. Candidates must carry Pencil, Eraser, Sharpener, Gum, Stapler, Blue/ Black pen, 7 recent passport size photographs, 4 sets of attested photocopies and original SSC, Intermediate memorandums, Residence proof, NCC Certificate, Consent from etc. along with them. Candidates selection will be made through Verification, Written Test, Adaptability Test-1&2& Physical Fitness Test and Medical Examination. #Weight: Proportionate to height and age. #Corneal Surgery (PRK/LASIK) not acceptable. #Hearing: Candidate should have normal hearing i.e. able to hear forced whisper from a distance of 6 meters with each ear separately. #Dental: Should have healthy gums, good set of teeth and minimum 14 dental points. #Health: Candidate should be of normal anatomy without loss of any appendages. He should be free from all communicable diseases and skin ailments. Candidate must be physically and mentally FIT to perform duty in any part of the world, in any climate and terrain. 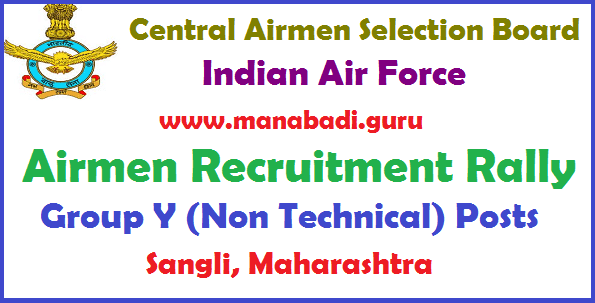 #All Eligible and Interested candidates can attend Airmen Recruitment Rally at Sangli, Maharashtra from 01.06.2017 to 07.06.2017.